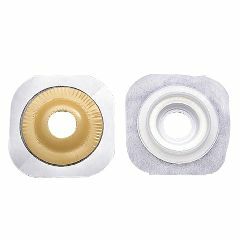 CenterPointLock Convex FlexWear Standard Wear Skin Barrier with Porous Paper Tape feature the unique Floating Flange and CenterPointLock closure, which ensure the highest degree of confidence, comfort, and security. All CenterPointLock pouches feature odor-barrier Quiet Film - an advanced pouch film (exclusive to Hollister), that minimizes the noise generally associated with ostomy pouches. Pre-cut openings with built-in convexity means added security and skin protection for recessed, retracted and flush stomas. The Floating Flange eliminates pressure on sensitive post-operative abdomens, while the CenterPointLock feature prevents unintentional pouch - skin barrier separation. Porous paper adhesive allows the skin to breathe. Thank you so much for facilitating this return and for making this part of the Allegro customer experience so much more positive. Your thoughtful attention to our situation has restored my faith in your company. Allegro should know that they have such a fine customer service representative on staff, and that your efforts go a long way to enhancing their reputation. I will assume that the credits will show up on our Accounts very soon.